A woman reacts at a makeshift memorial outside the Tree of Life Synagogue in Pittsburgh, Pennsylvania, Oct. 29, 2018. Photo: Reuters / Cathal McNaughton. 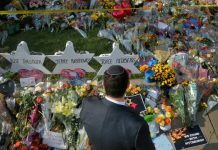 Bowers, who had frequently posted antisemitic slurs and conspiracy theories online, sat quietly through the hearing, dressed in a short-sleeved red jumpsuit and shackled at the ankles. He replied “yes” when U.S. District Judge Donetta Ambrose asked if he understood the charges, and he said he wanted to be tried by a jury. 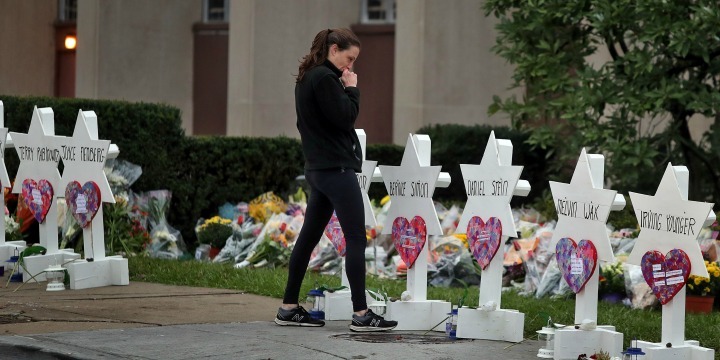 It also fueled a national debate over the rhetoric of President Donald Trump, who critics say contributed to a surge in white nationalist and neo-Nazi activity. The Trump administration has rejected the notion he has encouraged far-right extremists who have embraced him.